Located in the western part of the resort, these apartments are set in lush surroundings and offer modern comfortable accommodation ideal for both families or groups of friends who prefer the independence of self-catering. We were made to feel very welcome on arrival and were give a room next door to family who were already staying there which was nice. The staff, irina and Zorri were lovely and always greeted you with a smile after a 12 hour shift!!!! The maid was absolutely brill, and definately went the extra mile to please. The location of the hotel was really good as you were 10 mins walk from the hustle and bustle. I have just returned from a 2 week stay at sunny beauty hotel and highly recommend the place. We stayed on the top floor but with a lift in the hotel this was no problem. We had a pool view from our balcony. The receptionist's (Zorri & Irina) were the nicest I have ever met and were a joy to see every day (morning & night), they always had a smile even after working long shifts. Our cleaner (Toni) was also a star, even with 5 messy guys; she would clean up and leave with a smile. You hear a lot about how unsafe Bulgaria is and stories of cleaners taking money & valuable, this is certainly not the case, we had total trust in all the staff. It is a short walk to the beach and town, which suited us nicely as there was no noise at night. There is a main road to cross, but never caused us a problem. If I ever go back to Bulgaria I would stay at this hotel. It is not quite the Ritz/Hilton, but you normally get what you pay for and with this hotel you get just a bit more. Brilliant hotel - don't let the marketing shots put you off - it's not that pink!!!! The staff are fabulous, bedrooms vary spacious and clean, the sofa beds are rock hard though. Food was fine - though portions are a little large. Location is superb as I thought we were 300 metres from the seafront - but thank god we were a max of 10 mins walk away, it's mad busy and the beach fruit sellers are a nightmare. The staff couldn't do enough to make your stay enjoyable. There is no entertainment, and other than the pool and a little play ground, nothing for kids and teenagers - a pool table/darts/board games would be good. I would definately stay here again and recommend to anybody. right were do i start we were very aprehensive and looking farward to our holiday a lot.flying from teeside we were dissapointed that the plane was full full of drunken passengers .however on arrival to the hotel we were happy ..we were at the back with a small terrice .the hotel did leave bread and water as we arrived late .everything was perfect 2 large bedrooms .pots pans and plates .air con was a god send however we all got a sore throught from it.the pool is cold but you get used to it .the cleaners are loverly as are the reception girls .waiters are ok but if you dont tip they let you know .there was some bad pionts .the owner is by by far the moodyest sad little man i ever met .never talked to anyone .no entertainment at all.we did meet some fun people but there was a bit of anomosity from guests of other parts.becouse of what england done 6 million years ago they never seem to forget.food round the pool wasnt that good.however the beer wasnt that bad .1 pound a glass.as i said the staff are wonderfull. 4 minute walk to the center .however you do have to cross a very buisy rd.my kids loved it .dont they all.. Myself my husband and my mother visted here in june and we loved it, yes the pool is small but we made sure were were by teh pool early so we got the good sunbeds lol. beer was ceap in teh hotel compared to some places last year we were paying 4.5 lev for a beer in our hotel. food was ok we did have a meal in teh hotel one night and we oftern had lunch there. It is located a bit back from the beach and there is a main road to cross but never found it a problem. 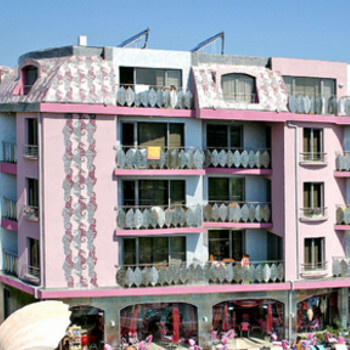 We liked the hotel so much tehre is 5 of us going next year it will be our 4th visit to sunny beach and by far tis is the best hotel we have stayed in and we have stayed in teh so called 5 star ones! Just returned from our first visit to Bulgaria. As we were allocation on arrival and arrived in the early hours, we thought we were stranded. However, after gathering our bearings, we were not far from the main prom. The accomodation was excellent, although at the height of the season the pool is too small and not everyone could obtain sunbeds. The rooms are of a high standard and the food is very cheap for a hotel.Would reccommend the apartments. The air conditioning was a god send and it is not only in 1 room but both lounge and bedroom. Excellent idea and much needed as it went into the 40`s. Only booked this holiday 6 days before we travelled and picked allocation on arrival as it was so cheap. After the suspense of finding out what the hotel was going to look like, we were overjoyed when we pulled up outside. It's brand new so everything is crisp and clean and the staff are really friendly. The apartments are light and airy and the air-conditioning is already a life saver even in mid-June. The pool is quite small and there aren't too many sun beds but as there's only 31 rooms we never found this a problem. The only aspect that some might find a bit off-putting, is that there are alot of hotels still being built in this area. Although this made the view from our balcony less than attractive, there was hardly any noise and after all, it's only a base isn't it? The beach and promenade area are only a 5 minute walk away so overall Sunny Beauty is well worth a visit.